I finally finished the book yay! Perhaps a 464 page book wasn't the best one to start for the readathon, but I had started it earlier in the week (I was about 60 pages in) and wanted to finish it. I did, and I think it did me in. I ended up really enjoying the book, even if it was about 100 pages to long. I'm not sure I have it in me to do any more reading, but maybe I just need a break for a bit. 2. How many books have you read so far? A grand total of one! 3. What book are you most looking forward to for the second half of the Read-a-thon? I'm not sure what or if I'll be reading more. This one kinda did me in. 4. Have you had many interruptions? How did you deal with those?Yes! I took one nap and the pets have been on a lets see how many times we can whine to get Colette's attention kick. They've had so many treats it's not funny. 5. What surprises you most about the Read-a-thon, so far? That I haven't been more active doing mini challenges. 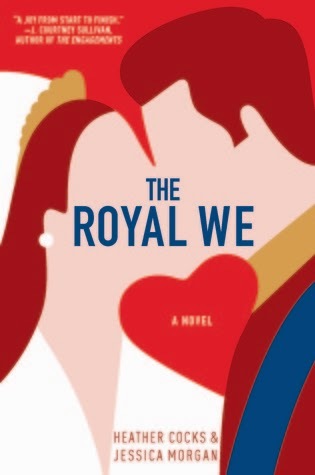 I am still reading The Royal We, and it feels like it will never ever end, but I am enjoying it--even it is glorified fan fiction of William/Kate. Pages read: I've read about30% of The Royal We from where I started at. It's slow going. Ohio, where the sky is gray and it's a whole 49 degrees according to weather.com, but I'm sure they are wrong because it feels much colder out! I always hate these things! I'm the distance assistant for author Gini Koch, proud aunt of Charlie and dog mom of Cleo. :) Three years ago I only read UF and PNR. Now I've swung the other direction and only read contemporary romance. I haven't done a read-a-thon in awhile, mainly because of my work schedule but today I'll be taking lots of breaks to do memes and visiting other blogs. I'll also try to post everything readathon related in this post so I don't have 20 million posts all relatively the same.